photo courtesy of South Dakota Public Broadcasting. Rapid City Stevens wins their quarterfinal match against Brookings at the Class AA Volleball Tournament Thursday. SIOUX FALLS, S.D. 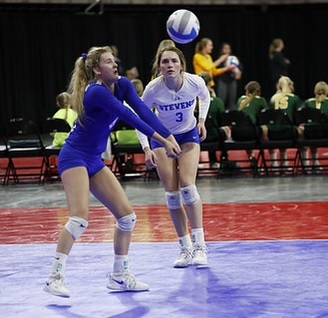 – Top-seeded Rapid City Stevens has moved to the semifinals as they won their quarterfinal match against Brookings at the Class AA State Volleyball Tournament today. Stevens won the first set 25-17, but seen Brookings play them tough in the second. In fact, the Bobcats held a 17-12 lead before Stevens settled down and came back to take the set 25-23. Brookings played tough in the third set, but Stevens was too much as they hung on for a 25-20 set three victory to take the match. Laura Petik led the Raiders with 17 digs. Elizabeth Schaefer and Marlee Schneider each added 9. Schaefer added 13 kills.